In 1966, Congress passed the National Historic Preservation Act. This led to the establishment of the Michigan State Historic Preservation Office, which maintains the Michigan Register of Historic Places. Wixom is home to several of these state historic sites. In 1855, Mrs. Lucy Wixom had a home built for the use of Reverend Samuel Wire and his wife Lucy. Mrs. Wixom and her husband Ajijah Wixom were among the area’s first settlers, and Reverend Wire was pastor of the Wixom Free Will Baptist Church at that time. In addition to being the Wire family’s residence, the house was used for worship and funeral services until the permanent church was built in 1865. Mrs. Electa Burch purchased the house from Mrs. Wixom in 1872. Mr. and Mrs. William Tiffin bought the house in 1897 from Mrs. Burch’s estate. In 1975, the City of Wixom bought the property from the estate of the Tiffins’ bachelor sons, Bill and Charlie, who lived there until their deaths in 1973. The City then leased it to the Wixom Historical Society (WHS), who restored it for use as a museum. WHS has affectionately maintained it since then. Today this home is known as the Wixom-Wire House. In 1985, the Wixom-Wire House became part of the State Register of Historic Places. It is Michigan Historic Site No. L1067. It is located on the southwest corner of Wixom and Maple Roads. The Wixom-Wire House was built in Gothic Revival style. The parlor has an alcove which originally held coffins. The door on the north wall was used for taking the coffins across the road to the cemetery. During the early 1920’s, the kitchen was added. The kitchen sink has a hand pump; the house never had indoor plumbing. The outhouse is original to the property. Period furnishings decorate the home. The Wixom-Wire House is open to the public for tours during the annual Ice Cream Social (held each year on the second Sunday in June), and during the December Wassail. Private or group tours can be arranged by contacting WHS. There is no charge for admission. All are welcome. Alonzo Sibley, an early settler and local philanthropist who made his fortune in farming and related businesses, donated land for the cemetery in 1837. It was platted in 1838 and became known as the South Commerce Burial Ground. Sibley became the first president of the burial society. In 1899, the cemetery’s wrought iron fence was erected after the women of Wixom held fund-raisers to pay for it. The money was presented to Mr. Sibley, who arranged for its construction and installation. The cemetery is located on the northwest corner of Wixom and Maple Roads in the city of Wixom. People of locally historical significance are buried here including early pioneers and at least eight Civil War veterans. For additional listings of those interred, contact WHS or see findagrave.com. For additional information regarding the Wixom Cemetery, please contact WHS or visit the City of Wixom web site. On October 23, 1987 the South Commerce Burying Ground (Wixom Cemetery) became part of the State Register of Historic Places. It is Michigan Historic Site No. L1464. The Wixom Historical Society provides tours of the Wixom Cemetery during the annual Ice Cream Social in June. Individual or group cemetery tours can also be arranged by contacting the Wixom Historical Society. In 1925, people of Finnish descent from the Detroit area purchased land and built a summer camp along Loon Lake in Wixom, so they could share the camaraderie and traditions of their native Finland. They established the Detroit Finnish Co-operative Summer Camp Association, an organization that remains active to this day. Some of the original buildings still stand, including many cottages and the 1927 dance hall. It is located at 2524 Loon Lake Road, east of Wixom Road in Wixom. On October 17, 2007, the Detroit Finnish Co-operative Summer Camp Association became part of the State Register of Historic Places. It is registered site number L2034. In 2007, it was added to the National Registry of Historic Places. The historic site sign entitled From Sibley’s Corners to Wixom is located on the northeast corner of Wixom Road and Maple Road in the city of Wixom. It commemorates the establishment of this community by early settlers. The original buildings on the site are no longer in existence; however, two related historic sites are still located across Wixom Road — the Wixom Wire House and the Wixom Cemetery. Every area of our country holds interesting anecdotes about our nation’s culture and history. Some of these regions have been designated National Heritage Areas by Congress. Part of Michigan, including Wixom, has been declared the MotorCities Heritage Area, due to the importance of the automobile and organized labor to the region. In order to educate the public about local contributions to Michigan’s automotive history, the MotorCities Wayside Exhibit has been created. It is a permanent collection of signs throughout the MotorCities Heritage Area, depicting community stories and events. There are three MotorCities Wayside Exhibit signs located in Wixom. Each sign illustrates a part of Wixom’s development as it relates to transportation. 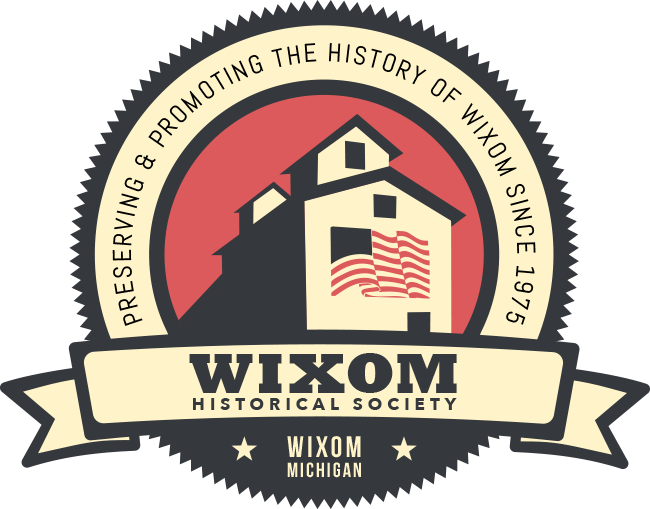 The Wixom Historical Society researched and documented the information on the Wixom MotorCities Wayside Exhibit signs. We sponsored these exhibits as a gift to our community. Each sign is easily accessible; all are along sidewalks in the city. Come to Wixom and see our MotorCities Wayside Exhibit Signs–you’ll be surprised at the stories our community has to tell! We hope the exhibit provides many years of enjoyment, education, and community pride. Find out about the local history of Pontiac Trail. This sign is located on Pontiac Trail, west of Old Wixom Rd. It is in front of the Gibson House. The arrival of the railroad had a tremendous effect on our community. This sign explains what happened. You will find the sign on the northwest corner of Wixom Rd. and Pontiac Trail, in Mack Park. The Ford Plant did much more than bring jobs to Wixom. There is a reason this sign is placed next to Wixom City Hall, on Pontiac Trail, east of Wixom Rd. There are other buildings in Wixom that are of historical importance to the community. Gibson Park is located on the south side of Pontiac Trail west of Old Wixom Road. The land was first purchased by Lewis Norton, Wixom’s first settler, on July 10, 1832 from the United States Government. The property was sold several times until Matthew Erwin Gibson (1817-1889), who immigrated to the U.S. from Ireland in 1830, bought 168 acres in 1861. Matthew Gibson married Mary Jane Morrison (1834-1899) of Commerce on May 1, 1861. At first they lived in a log cabin on the property, where they had four children: Jennie (1862), John (1864), James (1866), and Nettie (1870). The Gibson House, a two story Italianate style farm house which prominently faces Pontiac Trail, was built circa 1872. Matthew established a large farm, which was operated with assistance of his family and farm laborers. Crops included hay, clover, wheat, oats, Indian corn, Irish potatoes and apples. According to the 1880 Federal census, livestock numbered 2 mulch cows, 60 sheep, 50 chickens, 22 pigs, and 4 horses. He produced butter and wool. This indicates that his was a typical 19th century farm in Michigan. After Matthew passed away, the three surviving children, Jennie, James and Nettie each inherited one third of the property; Mary Jane Gibson lived in the home until her death. Jennie and Nettie sold their share to James the year of their mother’s passing. James and his wife Alma (nee Brown), who married on June 15, 1898, continued the family farming tradition. The emphasis was on dairying and mutton production. The orchards and vegetable crops were expanded. The large scale farm raised cattle, sheep, pigs, and chickens. Hay, field corn, alfalfa, oats, and wheat were grown as animal feed. Apples, berries, potatoes and other vegetables were sold to the public. The Gibson farm transported cash crops to market via the nearby railroad. Dairy products were sold to Wixom’s Smith Cheese Factory, which was located across Pontiac Trail, just north of the Gibson Farm. James and Alma had two children, Mildred (1901) and Harold (1909). As adults, both children opted for careers outside of farming. Mildred earned her teaching certificate from State Normal College (now Eastern Michigan University) in 1921. She taught at Royal Oak High School for forty years. Harold received both a bachelor’s degree and a master’s degree in engineering from the University of Michigan. He became a research engineer specializing in automotive engines. He married and had 3 children. In 1943, James passed away. Alma continued to work the farm with some assistance of her children and grandchildren. The family then began selling off small parcels of the land. The remaining acreage was rented to the Croft family, who farmed it from the 1950’s until the 1970’s. After Alma passed away in 1955, Mildred used the house as her summer home. The first indoor bathroom was added at this time. When Mildred retired from teaching in 1964, she had the rest of the home extensively remodeled. In 1965 Mildred returned to her Wixom home permanently, where she became an active member of the community. Harold passed away in 1993; Mildred died the following year. Matthew, Mary Jane, John, James, Alma, and Mildred are buried in Wixom Cemetery. The Gibson family had farmed the land for more than 90 years; it was used as a farm for over 110 years. The home and surrounding 3.31 acres were purchased by the City of Wixom 1n 1995. Today, Gibson Park is one of the City of Wixom’s popular attractions. It is the site of the Annual Founder’s Day celebration, a fun family event held every May. The park is also home to a Community Garden, where local residents plant and harvest their own vegetables, fruit, herbs and flowers each growing season. Park benches dot the Gibson Park landscape, as an invitation to visitors. Gibson House is home to the Wixom Historical Society. The Society displays local artifacts in the home, and hosts programs and events there. The Hopkins Barn, often referred to as the Munshaw Barn, is located on Pontiac Trail east of Wixom’s Community Center. The barn’s classic gambrel roof recalls a bygone era when Wixom was an agricultural community. It was built by Adelbert Hopkins in 1916, when he was 60 years old. Adelbert and his wife Lucy (nee Baker) had purchased the property in 1910, which at the time included a home and several acres of land. The family used the barn to store farm equipment and to shelter their horses. Lucy was the daughter of Albert and Sarah (nee Smith) Baker. Albert and Sarah married in 1856, and settled in southwest Commerce Township (now Wixom). A son, Lewis, was born to them in 1857. Lucy was born January 19, 1862. The Baker family lived near the area we now know as Wixom and Maple Roads, which was then called Sibley’s Corners. Jennie Smith, a 20 year old black woman, lived with the Baker family at the time of the 1860 census. She was the first female African-American resident of Commerce Township and Wixom ever listed in U.S. census records. Around that time, beginning in 1861, the United States was engaged in the Civil War. President Abraham Lincoln asked Michigan Governor Moses Wisner to form a regiment of Union soldiers from Michigan after Wisner completed his term of office. Colonel Wisner raised Michigan’s Twenty-Second Infantry, mostly with men from Oakland and Macomb counties. Twenty-nine year old Albert Baker enlisted, as did many other local men. The regiment left Pontiac on September 4, 1862, when Lucy was not quite 8 months old. Corporal Baker was promoted to Sergeant the following year, on July 26, 1863. Two months later, September 18-20, Michigan’s Twenty-Second Infantry fought in the Battle of Chickamauga. Though a victory for the south, there were tremendous casualties on both sides, (over 16,000 Union and 18,000 Confederate soldiers). Sergeant Baker was wounded in action and taken prisoner on September 20. He was paroled, likely due to the severity of his injuries, but died October 22, 1863 of wounds received in action. He is buried in Chattanooga National Cemetery. Sergeant Albert Baker is the only known Wixom resident to die in the Civil War. Sarah became a widow with two young children when Lucy was 21 months old. Sarah and the children left Sibley’s Corners. She became a housekeeper for Jay Marlatt of nearby Lyon Township, and married him in 1875. Lucy was 13 years old when Marlatt became her step-father. The Marlatt farm was located near the home of the Calvin Hopkins family, which included a son named Adelbert. Adelbert Hopkins married Lucy Baker on May 26, 1881. They had eight children: six daughters and two sons. Adelbert and Lucy lived in Lyon until 1910, when they bought the home and property in Wixom. Sarah Marlatt, Adelbert Hopkins, and Lucy Hopkins are buried in Wixom Cemetery. This family, as well as many early residents of Wixom, endured many hardships, but still assisted others and sacrificed for the greater good. The Hopkins Barn reminds us that much can be achieved with hard work, courage, and determination.